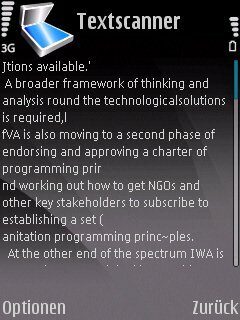 While testing Nokia’s E71 two months ago, I couldn’t find the following application on the phone I’d read about somewhere else: Nokia Multiscanner. I know that it apparently comes pre-installed on both the E71 and the E66, but on my trial device, it was just missing. Since I already LOVE Nokia’s BarCode reader and think it is a very smart application, I didn’t hesitate for a second upon seeing it as an item on my feedreader today and installed it right away. 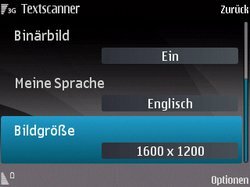 Unfortunately, the original source of that blog post is currently offline, but Google still provides other interesting resources about Nokia Multiscanner. 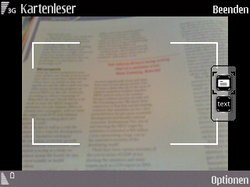 Nokia Multiscanner is an application for S60V3 Nokia phones that provides Optical Character Recognition (OCR) for scanned texts. 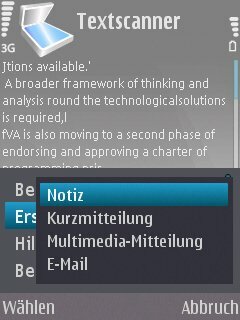 Currently, both business cards and document texts are supported – it even “reads” German texts and displays them on the screen for further usage. 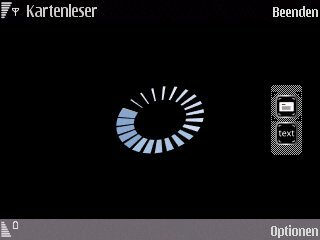 You can even zoom in and do the usual auto-focus to get your selected text in focus (doesn’t appear on these screenshots though as I had to simultaneously press two buttons at the same time to get the screenshot). 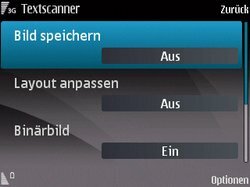 It will then display the scanned text and even ask you if you want to further save it as a note, a short message, mms or e-mail. Neat! The beautiful part is that this application really works to an extend where it is somehow usable. Scanning business cards is even easier, as it will already group different parts of an address to different fields (the user may then still edit). See this forum contribution on Nokiaapps.org for more details on the procedure (also includes lots of interesting screenshots). 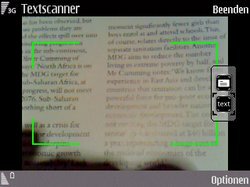 Nokia Multiscanner currently runs on my Nokia N95-1 and from what I’ve understood so far, Multiscanner was initially designed as a pocket translator tool – so the pure OCR functionality is a nice add-on. As for scanning business cards, I will always recommend using Nokia’s Mobile BarCode Reader instead and sticking your very own personal barcode to the back of your phone. omg, this is nice…cant wait to try it!